Victoria is the Administrator for The Eye Center and has worked in the health care industry for over 20 years. She has a Bachelors Degree in Health Care Administration and a Masters Degree in Public Administration with a concentration in Health Care. Victoria is a member of the American Academy of Ophthalmic Executives (AAOE), the American Society of Ophthalmic Administrators (ASOA) and holds certification with the American College of Medical Scribe Specialists. Patty has multiple duties at The Eye Center and has worked in eye care for over 15 years. Patty handles all billing aspects of our office. Her extensive understanding of insurances and filing claims assures that our patient accounts are always accurate and current. In addition, Patty is the Surgical Coordinator for all of Dr. Militelloâ€™s procedures. She works closely with the surgery center and educates patients about their surgery day. Pattyâ€™s genuine concern for our patients shows in everything she does. Miaisha has worked in the medical field for over 20 years. Her excellent customer service skills, attention to detail and ability to handle multiple tasks at once make her an expert at our front desk. Miaisha schedules appointments, greets patients for their visits, assists in making follow-up appointments and will help obtain authorizations for your appointment if needed. She handles every aspect of organization when it comes to our front desk, and is always looking for ways to improve the patient experience. Kristen has worked in the medical field for over three years. Her main position at the front desk is verifying your demographic and insurance information. Kristenâ€™s customer service skills and efficiency at the front desk help the practice to run smooth . 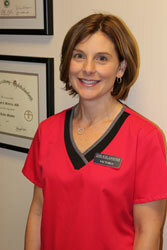 Georganne is a Certified Ophthalmic Technician (COT) and has worked in Ophthalmology for over 15 years. She is responsible for all aspects of the patient workup, as well as assisting Dr. Militello in completing the exam. Georganne also performs cataract surgery measurements and manages all medical supplies to ensure that we are always prepared for our patients. Her attention to detail is demonstrated in the thoroughness of her charting and documentation, and she treats every patient with care. Alison is an ophthalmic scribe. Alison has worked in the field of Ophthalmology for over 2 years, and is responsible for making sure that chart documentation is accurate and complete. She assist Dr. Militello with exams and ensures that patients leave with any necessary instructions. Aliâ€™s effieciency and customer service make her an asset to our practice. 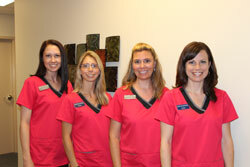 RaeAnn is a Certified Ophthalmic Assistant (COA). RaeAnn has worked in the field of Ophthalmology for over 15 years and is responsible for obtaining the preliminary information and testing for Dr. Militello to complete your exam exam. RaeAnnâ€™s customer service skills coupled with her ideas to continually improve our office make her a great part of our team. Maria is a Certified Ophthalmic Technician (COT) and has worked in the field of Ophthalmology for over 15 years. Maria is responsible for obtaining the preliminary information and testing for Dr. Militello to complete his exam. Maria also performs the measurements needed to perform cataract surgery. Mariaâ€™s attention to detail and her delicate treatment of patientâ€™s make her a great addition to our office.